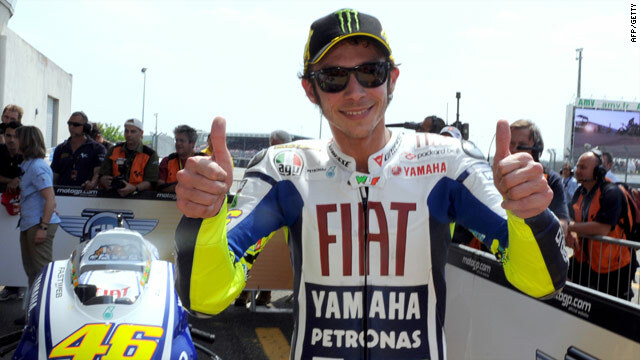 Rossi gives the thumbs up after claiming yet another pole position at Le Mans. (CNN) -- Italy's Valentino Rossi edged out Yamaha teammate and title rival Jorge Lorenzo to claim pole position for the French MotoGP at Le Mans. The top spot on the timesheets changed hands several times in an exciting qualifying session on Saturday, with defending champion Rossi setting the fastest time on the 28th of his 30 laps. Rossi lapped in one minute 33.408 seconds to edge championship leader Lorenzo by just 0.054 seconds. Spain's Dani Pedrosa claimed the third spot on the front row for Honda. Australian Casey Stoner also strongly challenged on his Ducati, but had to settle for fourth fastest, just ahead of teammate Nicky Hayden. Home rider Randy De Puniet and Andrea Dovizioso of Italy were sixth and seventh fastest. Colin Edwards of the United States, Suzuki's Loris Capirossi were eighth and ninth best with Aleix Espargaro completing the top ten with his last lap. Rossi, who has won three times at Le Mans, trails Lorenzo by four points in this year's title race after both have secured wins in the opening two races of the season. The 31-year-old has been troubled by a shoulder injury after a motocross accident in April and admitted it was still a problem. "I am still worried about my shoulder because after 10 or 15 laps today I started to lose power, but I hope adrenalin will take over in the race and that I will be able to stay fast right to the end," he told the official MotoGP Web site. Lorenzo is hoping to double up after winning at Le Mans last year. "I need to try to get a good start tomorrow and be stronger during the first few laps, then I think I can fight for victory," he said.